This will be the final post in this series of Denmark-posts, I promise. I didn’t want to make the other posts too long, for the sake of the few of you who will have read them. This post will be about the choir-competition, the amazing people I’ve sung with, and how I feel singing in choirs is an experience no one will understand until they have tried. First things first, the choir-competition. Parallel with, or rather, as a part of the festival, a choir-competition was held with six great choirs from around the world. Uranienborg Vokalensemble from Oslo happened to be one of them. They also happen to have the same conductor as Cantus Aeterna, Elisabeth Holte. They sang brilliantly at the first two concerts, one of which I witnessed, and managed to qualify as one of the top three choirs, earning them a place in the final. The final became an interesting, rather unusual, but very engaging and fun experience for us in Cantus Aeterna. Someone had bought face-paint and flags. This resulted in almost all of us showing up to the formal, serious, high-brow, broadcast-live-on-radio choir-competition-final waving Norwegian paper flags and having Norwegian flags painted onto our faces. Despite us pulling off multiple Mexican waves (when nobody was singing of course), Uranienborg Vokalensemble only placed third in the competition, with the two other choirs jointly winning. Of course, we all thought UV did very well and should have won. Judging by the amount of people who came up to us, having somehow guessed what choir we were supporting, we were far from alone in thinking they were the best. Still, it becomes a matter of opinion, so congratulations to Ekatarinburg Municipal Choir from Russia and Kammerkoret Camerata from Denmark on winning. Now, some words about the social aspects of being in Denmark with Cantus Aeterna, hanging out with the other choirs, and generally singing in choirs. People from all over the world sing in choirs, and I am sure singers in all of them have similar experiences, no matter what kind of music they are singing, regardless of where they sing it. They all feel the thrill of singing in a concert and the satisfaction afterwards when the choir has performed well. The same subtle unspoken messages are passed between singers of the same voice everywhere, “yup, that note is a horrible one”, “Yes! We finally managed those five bars without any mistakes!”, “Ooops, my bad”. I hesitate to say that a choir is like a well-oiled machine, because it’s not and I don’t think it should be. It’s too human for that. It truly is a group of people playing on a team, all doing their utmost to make the choir as a whole as good as possible. A lot, of course, depends on the conductor, a department in which I consider myself to have been very fortunate. This is of course open to debate, and I am far from impartial, but I firmly believe that I have been fortunate enough to sing under two of the best conductors Norway has to offer, Arne Hadland, who has now retired, and the afore mentioned Elisabeth Holte. They are both brilliant in very different ways. Having sung under Arne for 12 of the 13 years I have spent in choirs, having had Elisabeth conducting Cantus this past year was quite a contrast, and an experience for which I am very grateful. Having read a description given of her during the live radio-broadcast of the competition-final, it is hard to put it any other way; she doesn’t conduct the music, she paints it. Elisabeth really believes in the wonder and excitement derived from music being a unique product every time it is performed. A piece really may sound completely different from concert to concert depending on how she, in that specific moment, decides to conduct it. As a singer this is of course rather challenging. It relies on the choir being good, and is completely dependent on every single member of the choir paying close attention to the conductor, but when you finish a piece you have sung dozens of times and think “Wow, I never imagined it sounding like that. That was wonderful!” it really is worth it. I am very grateful to Elisabeth for having “used” Cantus Aeterna to do this, and the results of it have been fantastic. The confidence she puts in the choir when making them do something “live” which they have never done before is amazing, and the risks pay off almost every time. Hanne, Ingrid and Johanne from Cantus Aeterna. As for Arne Hadland, it would take 3 blog-posts of their own to even begin to describe him. He is considered a regional treasure within the Stavanger choir-community, is the first and so far only person within his field to have been awarded with a royal medal for services to society, and has an unparalleled ability to make everyone who has ever met him feel like his closest friend. Having sung almost weekly with him for 11 years I am still not quite sure of exactly how he does it, but he manages to extract the same enthusiasm for music from everyone, be it 8 year old boys or 55 year old men. He has, and will continue to mean so much to so many, including myself. Even though he has retired I am hopeful that he will still do some choir-related stuff here and there, and I will do my very best to be there when that happens. The conductor aside, most importantly, a choir is a group of people who genuinely love singing. What happens when a group of people who love to sing get together? They sing. That is one of my favourite things about socialising with other choir-singers, the collective random singing that happens almost automatically when a bunch of them gets together. I have experienced it a lot when being at gatherings with Cantus Aeterna, and I was interested to see if it would also happen in a more international setting. It did. 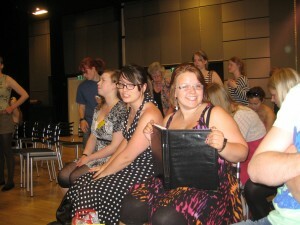 There generally wasn’t much time for socialising with the other Nordic youth-choirs. However, on our last night in Denmark we managed to make something happen. After the Swedish and Finnish choir had sung a few pieces at the festival-wide evening social at Ridehuset (Most of Cantus Aeterna weren’t there, so no singing from us), a few of us who were there from Cantus decided to try something. 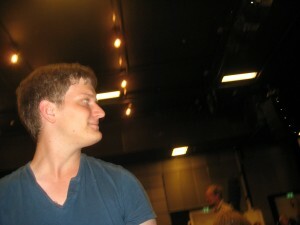 We were going to teach the Finnish choir one of our songs, a Swedish folk-tune we have used at the end of our concerts. The Finnish choir were, of course, up for a bit of fun, so it didn’t take long for all forty-odd of them to assemble outside Ridehuset on the lawn. We had barely started teaching them the tune before something somewhat predictable happened. Shockingly the Swedish choir also knew the Swedish folk-tune, so they came onto the lawn and started singing along with us. In no time the Finnish choir had also picked it up, and we stood on the lawn, probably 70 or so youthful singers, singing loudly at about 11 pm. The youth-choirs on stage during the workshop concert. Photo by Jacob Mathiasen. This got the ball rolling, and the Swedish folk-tune glided over in one of the songs we had been taught in the workshop. Pasi would have been proud. Then it continued from there. Various popular music started getting sung, and we were on the lawn singing Bon Jovi, Queen, Greece and various other singalong songs. Having a large group of competent singers singing something like Bohemian Rhapsody becomes very interesting in a very cool way, and it is a very good way of spending a Saturday night. When the singing had broken up I spent the rest of the evening hanging out with a large group of Finnish people. There is this old saying, “Never hang out with a group of Finnish people without having at least one other Norwegian person with you as a backup”, so I teamed up with Ingrid from Cantus. There isn’t much to say other than that I really had a very fun evening just sitting and talking to quite a large number of people from the Finnish choir. I’ve never really spent much time with Finnish people before, and there are a lot of different prejudices to discuss and jokes to tell. I really am extremely grateful for a lot of things in life, and what I have experienced through choirs is certainly one of them. I can’t think of a way in which I would otherwise have met so many brilliant, genuinely talented people as I have through choir-music. A lot of people say I have a very positive outlook on the world, and for me it is not hard to see why. Through singing in choirs I have seen so much greatness, genuine kindness, caring and dedication that it seems ridiculous for me not to have a positive outlook. While I will probably end up being an Engineer, Computer Scientist or a combination of the two, I will always endeavour to continue singing in choirs. Even though hardly anyone will still be reading this I want to give my sincerest thanks to every single person I have ever been involved with through choirs, the conductors I have had, and the people I have sung with. I also want to extend thanks to the choirs from Denmark, Sweden and especially everyone I spoke to from the Finnish choir for making my trip in Denmark what is was. I want to thank everyone in Cantus Aeterna, Arne and Elisabeth for giving me the experience that has been Cantus Aeterna. I’m a choir-boy, and whatever happens, I always will be.